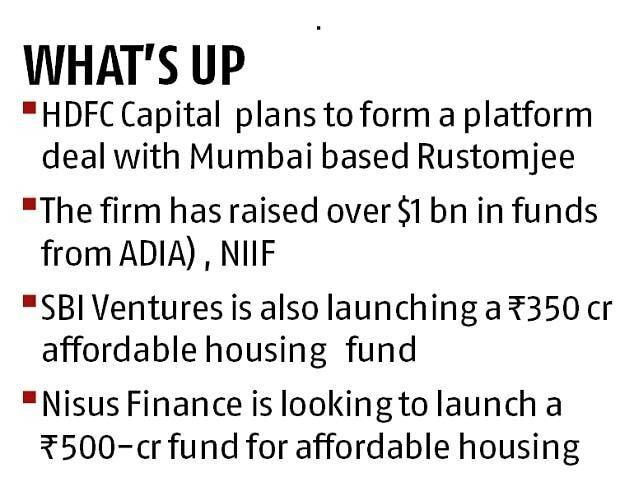 HDFC Capital, the real estate fund management arm of HDFC, is looking to form three platform investment deals with property developers for affordable housing, said sources in the know. Platforms are like joint ventures wherein the partners bring in capital and the developer partner develops projects. HDFC Capital has in principle agreed to form a platform deal with Mumbai-based Rustomjee and is in talks with two other developers for similar deals, sources said. “They have realised that affordable homes are selling well despite the slowdown. That’s why they are looking at tie-ups with serious players,” said a source. An email sent to HDFC did not elicit any response. HDFC Capital has raised over $1 billion from the Abu Dhabi Investment Authority (ADIA), National Investment and Infrastructure Fund (NIIF) and others, said sources in the know. In February last year, Prestige and HDFC Capital announced a Rs 2,500-crore platform to invest in affordable housing projects. A month earlier, HDFC Capital formed a Rs 500-crore investment platform with Mahindra Lifespaces. HDFC Capital formed a similar deal with NCR-based ATS Infrastructure. While US-based Blackstone recently bought a controlling stake in Aadhar Housing Finance, domestic fund managers are getting into this segment. SBI Ventures, a step-down subsidiary of SBI, is launching a Rs 350-crore affordable housing fund. It will target top eight cities in the country. Another Mumbai-based fund manager, Nisus Finance, is looking to launch a Rs 500-crore fund and raise money from domestic institutions and family offices. The fund manager plans to invest Rs 50-60 crore per deal and looking at an internal rate of return of 20-21 per cent, said Amit Goenka, managing director and chief executive, Nisus Finance. “We are focusing on projects that meet PMAY (Pradhan Mantri Awas Yojana) criteria,” Goenka said. In 2015, the Centre announced the credit-linked subsidy scheme (CLSS) under PMAY (Urban), offering an interest subvention of 6.5 per cent on housing loans up to Rs 6 lakh for a tenure of 20 years to economically weaker sections (EWS) and low-income groups (LIG). The scope of the CLSS was widened to include the middle-income category. With effect from January 1, 2017, the MIG scheme was rolled out, with an upfront interest subsidy of upto Rs 2.3-2.35 lakh to borrowers, covering two income segments — Rs 600,001 to Rs 1,200,000 (MIG-I) and Rs 1,200,001 to Rs 1,800,000 (MIG-II) per annum. Anuj Puri, chairman at Anarock Property Consultants, said the government was trying to fuel the affordable housing segment by incentivising both supply and demand. According to Anarock research, 38 per cent of the launches between 2013 and 2018 pertained to the affordable segment (units priced less than Rs 40 lakh). “With so much impetus to affordable housing, this segment has seen a better offtake than other segments. Therefore, with an aim to reap returns in this booming phase, many PE funds are looking to launch affordable housing focused funds,” Puri said.